This weekend I’ll be putting on my pinny, and getting ahead with my Christmas baking. On Saturday I’m taking part in a festive baking workshop hosted by Lewes based Seven Sister’s Spice’s cookery school, where I’ll be cooking up cranberry sauce, chutney and Christmas biscotti. Then, Sunday is stir up Sunday. On that day I’ll get my kids to help me stir up a tasty, lucky coin-filled Christmas Pudding. Let’s get this straight. I’m not a great cook. But I do like the routine of getting a date in the diary to get stuff I dream about… done. It’s similar to planning the creation and distribution of content. You see, to build an audience and guide it into action requires not only valuable content but also consistent publishing. For consistency, you need to plan ahead. Cranberry sauce and biscuits freeze well, so before your diary fills up and unexpected guests turn up, you can stock your kitchen with tasty treats. By the same token, before clients and work-related activities get in the way, you can create marketing content such as blogs, e-books and e-mails in advance. Here’s the thing. The more preparation you can do in advance the more time you’ll save. Consequently, the more consistent your publishing and promotion will be. And you can be sure you’ll never miss important dates and milestones. 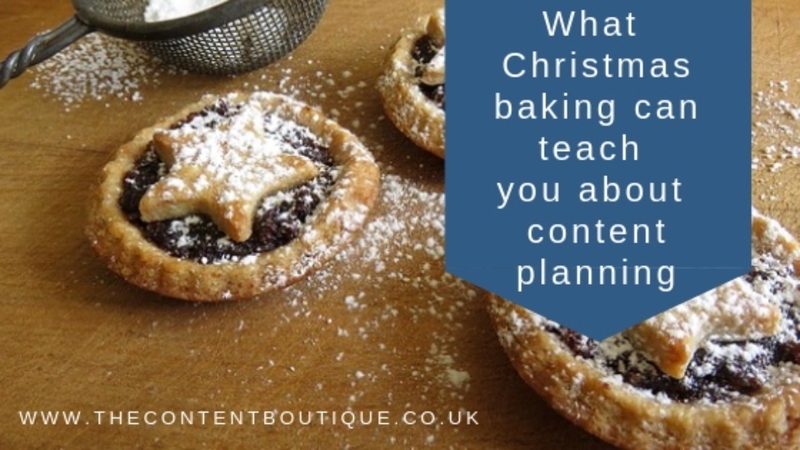 So where do you start with content planning? Knowing who you’re likely to have in your house, (grandparents, kids, friends and relatives), over the festive season makes planning easier. At Christmas, it pays to think about likely eventualities. Impromptu drinks parties. When friends and family drop in. Treats to keep the kids distracted when you’re stuck in a traffic jam on the M25 on your way to visit relatives. Likewise, the reason you create content is to guide people towards taking your desired action. So start with what you want your readers to do and then work backwards. Blogs, PR, checklists and cheatsheets. Educational content, comparison posts, case studies, product datasheets/FAQs, videos, and of course, email. Content that shares positive reviews such as comparison posts, testimonials and product demos, discounts and special offers. There’s nothing more annoying than getting halfway through a recipe, then realising you don’t have enough eggs. Bakers start by listing ingredients and conducting cupboard stock checks. Similarly, you don’t want to be in the position where you waste time having to dream up content ideas because you haven’t stored them up. It’s best to brainstorm topic ideas upfront. You can start by making a list of every question your customers ask you. Then pop them into an editorial calendar. Do this, and you’ll have a simple content plan for quite a few months ahead. In the festive baking kitchen, you’ll need cake tins, cupcake cases, baking parchment, airtight containers, and cling film. To save time and effort creating and distributing content, you can get access to a wide range of tools, most of the basic versions of which are free. I mentioned before I’m not a baker. To help me get all the tasks I need to do done, I write a timeline for method and preparation and stick it on my fridge. In a like manner, you can break content creation tasks down into manageable chunks and schedule a time to get them done. Usually, when I buy the ingredients for a Christmas pudding, I’ve lots of leftovers to contend with. As last year’s festive baking workshop, Chloe from Seven Sisters Spices taught me, I can use my leftovers in a Christmas Biscotti. Whatever content you produce, you want to get maximum mileage out of it. One way to do this is to create visual snack packs using Canva. By this, I mean extract snippets from your content and repackage them in various formats so that you can serve them up over social media over a period of time. Just as you can package Christmas goodies modestly in cellophane bags and tie with festive ribbon, don’t try to do too much. Keep your presentation simple and manageable. It’s the words that persuade and sell. And I’m not just saying that because I’m a copywriter! Finally put on some cheesy Christmas music while you plan! Do this, and your wish for a practical, actionable content plan for 2019 will come true. Happy baking and content making! If you would like help with content planning and writing content as a result of your plan, then drop me a line to get information about pricing.